I just installed the xtra-10 on a '94 Indy Trail and used JB's measurements. On the link on top the front mount says 4 1/4 inches and JB says 133mm = 5 1/4 in. from the top. Is there a differance in the '94 tunnel? Just want to get it right before the snow. P.S great info on your site JB and I will be calling you to get some shocks rebuilt. as it says on my site the measurements are from a 97 Ultra SPX what you are installing it in makes little difference it is more of what the skid came out of. Some newer extra 10 skids had more travel in the front arm which would call for raising the front arm but people have argued that point with me for years so I stopped fighting it. What you would get is not enought ski presure and it would be easily resolved by tightening the limiter strap but at the expense of an inch of front arm travel. [br]as it says on my site the measurements are from a 97 Ultra SPX what you are installing it in makes little difference it is more of what the skid came out of. Some newer extra 10 skids had more travel in the front arm which would call for raising the front arm but people have argued that point with me for years so I stopped fighting it. What you would get is not enought ski presure and it would be easily resolved by tightening the limiter strap but at the expense of an inch of front arm travel. It's out of an '02 XCR. Would moving the back mount to the lower hole accomplish the same or throw everything off? it should, especially if you need room for studs or a deep track. Other wise you usually mount as high in the tunnel as possible to lower the CG. okay so looking at the standard length skid, my 95 indy 500 was set up at positions B for rear & A for front, when i went to the place where i got my skid from i took a bunch of measuments & none were the same but they werent off by much. i wanna keep the B position for the rear because it will give me more clearance. my question is since the average move for the extra 10 was about an inch 1/2 could i move the plate one Rivot hole forward & just drill one more hole ? 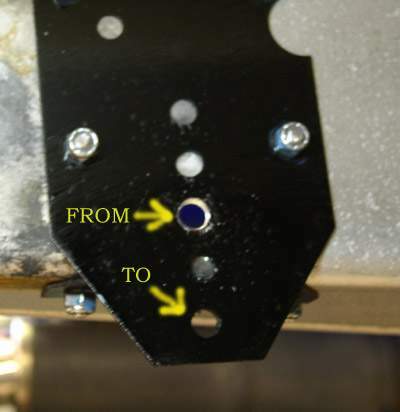 As for the front & from the first diagram i posted i have those brackets mounted in my tunnel with the holes cut out of the bracket but not cut in the tunnel itself, could i drill my holes in 1 of the 2 positions lower (shown in the diagram) ? this is a picture i took of an indy 500 with the extra 10 swapped in it. it looks like he did everything i mentioned but didnt use the B position on the rear. but his skid is completely diff from mine !! okay since i didnt recieve much help i decided to tackle it on my own, & i have issues. when i first mounted it it didnt wanna fully compress/ the suspenssion was really stiff/ & track was "loose". After putting the front mounts back into the stock location my holes are almost exact to the measurments i have on paper, & my center to center distance is about 22 3/4 (from the write up it should be between 22-23 so im good there) However the track is really tight (with tension all the way loose) the suspenssion will compresses no problem when i jump on it but its not very stiff at all ! i adjusted the springs to the stiffest point & it feels the same... Any help would be appreciated ! You say your skid looks different than the pic? The one you posted is an xtra10, post a pic of your skid. If you have an edge or xtra12 or M-10 skid the mounting points are different. I did the the swap moving the rear mount 1 bolt forward (like your second pic) and it worked great. ive come to the assumption that maby the adjustable shock isnt at its stiffest point & since i dont have the remote wire i cant adjust this at the moment, But how would that explain my track issues, my bolts are flush so the idlers cant go any further forward. also when i ran the sled it makes alot of clicking noises from the slides ( i assume the track is slapping the slides because of how tight it is... ohh an yes its an extra ten, i meant different because it doesnt have the adjustable shock nor fox shocks. the skid came out of a 96 XCR 440 & i moved the back plate more than & inch Thanks for your reply ! if having the front mounting points to low, tighten up my track ?